Finding Wonderland: The WritingYA Weblog (archive): Toon Thursday: Now With Added Linkage! Yup, Toon Thursday is back after a week's hiatus for the Under Radar Recommendations. I like having an excuse to take a break now and then. Thinking of a funny joke every week is kinda hard. (Can't believe I used to write a humor column every day...) Anyway, today's Toon Thursday is in honor of the fact that I spent what seemed like eons yesterday writing my query letters for my YA novel...and finally sending out proposals to two agents! Yay! Also, in blog news, Betsy at Fuse #8 has announced her first official podcast edition of A Fuse #8 Production. She wants your feedback, so go check it out! Also, Writer's Digest presents a pretty amusing blog by Kevin Alexander called This Writer's Life about the tribulations of a writer just starting out. I can relate. I particularly like his mock quiz entitled Are You Ever Really Going to Finish that Novel? (Notable quote: "3. Agents like a brief selling handle summing up the book's main plot. Which answer most closely resembles the state of your pitch? ... D. My book will have several chapters and a main character who's probably going to be a woman. Or a man. Definitely one of the two.") Lastly, the editor of Guide to Literary Agents keeps a blog here, with periodic updates and new listings of agents. There's a category for posts related to children's writing, too, though it doesn't seem as lengthy as other categories. Yay, indeed -- good luck! Funny how the only thing in the chart that actually does take as long as you think it will is the revision. Even if few things actually change, figuring out what those things are is no small task. Dividing up the pie chart was surprisingly hard! 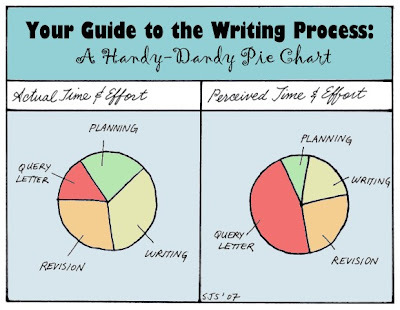 I had this silly one-liner of a joke in mind involving the difficulty of writing the query letter relative to the difficulty of the writing project as a whole, and then I had to make judgment calls about the proportion of the rest of the pie slices. And here I thought I'd picked an easy cartoon for this week! !